While we’re sure most Hackaday readers were raised by arcade games featuring sprites, pixels, and other shiny brightly colored squares, this was not always so. Many classic arcade games – Lunar Lander, Gravitar, and Asteroids in particular – used vector displays. Instead of drawing individual pixels, these games functioned more like an oscilloscope, drawing lines. When [Todd] and [Andrew] got their hands on a monitor from an old Asteroids cabinet, they knew what they had to do: build their own vector arcade game. The guys made their own DAC and Amplifier board that plugs right in to a Nexys2 FPGA dev board. This was after they tested out some 3D drawing code with a gnarly handmade R2R DAC they used to draw and rotate a cube on an oscilloscope screen. Not only did the guys build a vector video card, they also connected the FPGA’s VGA out to a monochrome monitor for an in-game HUD. Awesome work that blows away anything available in the golden days of vector arcade games. It’s a beautiful piece of engineering that certainly deserves its own cabinet. Video of the game available below. Wow, really impressive. I always thought that technology was pretty cool. Is that a space-dog on the VGA monitor in the video? Brian’s totally right, a cab for this setup would be totally rad. As an owner of many partially-finished hacks though, I definitely understand if that never gets done. Unbelievable – and you took me back 30 years in a stroke. I love your instrument stack there also, excellent choices for scopes. Cool project. I always loved the look of the vector games. At the time they were popular, the quality of raster games was pretty low as far as resolution, sprite sizes and capabilities compared to what we’re used to today. This enabled the vector games to hold their own when done right. The right type of game design really worked well vector style. Gravatar is a great example. 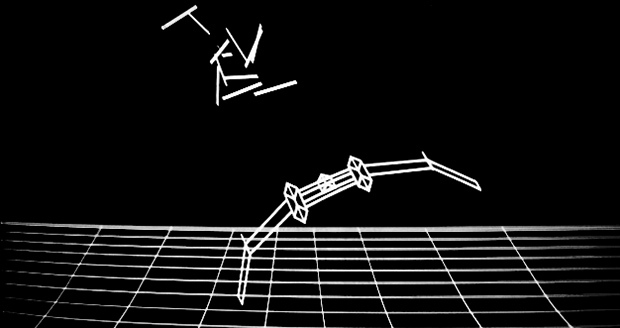 However the intro missed the best example of the vector genre ‘Star Wars’ which was a brilliant use of the technology. Anyway, I love this project. It would be cool to see this turned into an FPGA Graphics board for the RasPi and run all the vector games in MAME. I’m not old enough to have played any of the vector games when they were new, but I like the look too. It just blows me away what developers of games like Elite were able to accomplish. Let’s not forget Tempest and Battlezone! Omega Race, TAC SCAN, Space War, Armor Attack and more. I worked at a company called Interactive Machines in Westlake village Ca. We used stroker graphics to do flight simulators for the #airforce# top secret stuff at the time. Blew away anything you can imagne for graphics in the early 80s. We showed off a raster graphics on vector graphics monitor at SIGRAPH back then. where we did full color raster that could have vector on top of it. Very cool tech for the time. This hack is awesome for re purposing that cool old hardware. By the way – thought about using depth cueing ? – modulate the brightness of the vector based on the distance of a point on the vector and the observer. I recall that many vector games used depth cueing to make enemy ships appear smoothly as you approach them.